BBC NEWS | Have Your Say | What now for the BBC? We discussed the impact of the Hutton report in our phone-in programme, Talking Point. 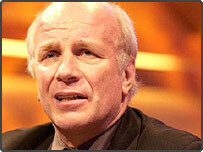 Greg Dyke has made it clear he was forced to leave his role as director general of the BBC by its governors. He said he had offered to resign if he did not have their full support and they had agreed that he should go. Mr Dyke also revealed the governors who dismissed him had considered quitting in the wake of the critical Hutton report on the death of Dr David Kelly. Meanwhile, the Culture Secretary Tessa Jowell has insisted the Government never asked for resignations from the BBC. Were Greg Dyke and Gavyn Davies right to be critical of the Hutton Report? Should there be greater regulation of the BBC? What will be the legacy of the Hutton report? Send us your comments. The people of the UK who support the BBC should organise against those who want to damage it. We need a campaign group to, SAVE THE BBC. Let the licence payers decide on who the next governor should be. A voting form could easily be posted to each TV licence payer in the country who can then vote on the next Governor. Let's trust the licence payer to decide on the next Governor and remove this responsibility from corrupt politicians. The BBC has lost my respect over the way it is behaving even now in its biased reporting since Hutton. I hope when the next Charter is discussed it will be decided to cut the licence fee by 50% and the BBC is made to cut its cloth accordingly! I would like to say the following: - 1. The BBC was wrong about the report, 2. I would trust the BBC more than the government, and 3. Hands off the BBC, I would much prefer to have an independent BBC. True politicians are not trusted by the public; but that has always been true. But now the BBC is not trusted and that has only occurred because of the Hutton inquiry into the Gilligan story. The BBC seems to be in denial, trying to ignore this major fact. The BBC was respected throughout the world, that respect has now gone. A critic once wrote of a novel that it was both true and original but what was true was not original and what was original was not true. This so clearly describes the Blair government's dossier arguing for the Iraq war that, the Hutton report notwithstanding, the dossier had to be 'sexed up' to be even halfway convincing, and this was accomplished through sins of omission and commission. Greg Dyke is absolutely right to criticise or even condemn Hutton Report. This report is a disgrace and affront to the decency and intelligence of the common people. He along with his paymaster, Blair thought that people will accept whatever they say, regardless of the fact. Wake up you lot. As far as I can see the BBC's doing fine. Now that all the hype has died down, it is clear that the government doesn't look any better after the Hutton report. In fact, in some ways it looks worse. It appears the BBC is determined to perpetuate its own misery by fighting the reality it refuses to accept. Every protest over what has happened so far since the Hutton report is that much more pain it will endure before transition to becoming a responsible reporter of the news again. If there was no deceit over WMD then either the government or military intelligence were in error. This looks like incompetence to me. So, in a manner similar to the BBC, I want to see a long list of resignations from both. We cannot trust the BBC anymore - but we still have to pay their fee! Frankly, the Hutton report is incredibly boring. I can't bring myself to follow the story, much less to care about it. The BBC is wonderful, whatever is said. First and foremost the whole board of governors must go. They were in this together and should leave together. They knowingly betrayed honest journalism. There were no innocents in that crowd. Whilst they are there the BBC will not recover its very tarnished reputation. There is redemption but not while the governors are there. Too much guilt. Whoever said that Lord Hutton was God? The BBC should never have apologized for its reports. Getting some things wrong is human, but the main thesis of the BBC was justified: The US and British governments highly exaggerated the case for war on Iraq. Otherwise, where are the WMD and the Al-Qaeda link? The initial mistake by Andrew Gilligan was relatively minor, should not have happened, but minor none the less. The mistake by the BBC was not to admit the mistake and apologise for it immediately. By pushing such a vigorous and ultimately ill advised complaint, they made a huge mountain out of a molehill which ultimately led to the departure of two very good people. Nobody has won in this and the main and far more important topic of poor intelligence has been sidelined. This has been the failure of the BBC and the government's biggest success, which does not say a lot for either party. The BBC made a reporting error which contributed to the death of Dr Kelly, and also led us to have an important debate on the way we were taken to war. Resignations occur at the BBC. The government made mistakes, which contributed to the death of Dr Kelly (see Hutton report), and quite possibly led us into an illegal and unjustified war. Where are the resignations there? It was right of the governors to demand Dyke to leave and thus limit the damage for the BBC. He sees the dispute as a match between the government and the BBC, and thus got the BBC independence in reporting involved. Also he allowed himself to let the Kelly case become personal with Campbell as his opponent. His reactions after his resignation are further proof that the governors took the right decision. I am sure that the BBC will survive this shock but they should come out of the denial phase asap. We relied on BBC for fair news. A regulated BBC is the last thing we would like to watch. The Blair Government is trying to destabilize a great British organization. It is very sad. It is not unusual for Prime Ministers to resent the independence of the BBC, the same was true of Margaret Thatcher and the reporting of the Falklands War. What Blair has succeeded in doing is damaging the BBC and undermining its independence. It is very important for the public to show they value the BBC as an institution that must, occasionally stand up to government, even if they will also, occasionally, get it wrong. Those who do not understand the basics about ethics in journalism and the concept of accurate reporting, checking facts, etc, do not see what the BBC did wrong. Those who know more about this sort of thing do. In order to maintain a reputation of credibility, rules must be followed. The BBC blundered this badly and so it was right that Davies, Dyke and Gilligan resigned. The BBC must now make a concerted effort not the make the same mistakes again. The people describing the report as a whitewash are missing the point. Lord Hutton's remit was not to investigate the basis on which the Government took Britain to war. It was to investigate the death of Dr Kelly and Andrew Gilligan's story that provoked it. He clearly found the story was a piece of unsubstantiated fiction. Given the gravity of the charges made in the story, it was right Davies and Dyke had to resign. It is most unbecoming of Greg Dyke to now be making criticisms of the report, it shows that he has learnt nothing from the episode. The government should get out of its pram. We, the public, need to know what's going on and no-one does a better job than the BBC. The BBC has resolved to improve its complaints procedures and that should be an end to it. No more grovelling apologies, no more dramas - they should be left to carry on reporting as normal, giving us, the public, the information we need to know about the government so that we can form our own views. Yes, they were right to be critical of Hutton report. No, there should not be greater regulation of BBC. Your news coverage is better than any other, your newsreaders and reporters are the best. They are all smartly dressed, speak clearly and articulately and give accurate and unbiased reports. The government should not interfere in any way. We, the viewers and listeners pay the license fee and I think I receive excellent value for it. I too want to express my support for the BBC post-Hutton. What worries me is whether a BBC worthy of support still exists, at least at its most senior levels. Hutton should be confined to a journalistic mistake for which the organisation has paid most heavily. There are worrying signs - the Greg Dyke 'resignation', the Absolute Power issue - that the BBC's top management is turning Hutton into a charter for censorship. The BBC has lost all credibility and has been found to twist the news for its own purposes. The license fee should be terminated immediately. Perhaps too that with Dyke gone the standard of intelligence in the programming will be raised! I want to express my unswerving support for the BBC, the Today programme and Greg Dyke. The Hutton report, in my view, was a whitewash. Of course there were some mistakes by the BBC - relatively minor. It is frightening that the unjustified, self-centred anger of an unelected communications manager should be allowed to have such disastrous influence. The BBC must continue to investigate and question rigorously. It must not bow to such pressure. The BBC should stand firm and put this episode behind them. Downing Street has repeatedly denied stories only to have admitted them true at a later date. The BBC has got one story slightly wrong they have nothing to worry about with regard to standards. In an international media landscape dominated by the likes of CNN and Fox News, the BBC is greatly appreciated for its courage, impartiality, sobriety and good judgment. My fear is that the British government will now try to "punish" the BBC by imposing an editorial line, curtailing its independence, or by reducing its resources. I hope I am wrong. The government may have got off lightly in the Hutton report, but that does not mean that the criticisms of the BBC weren't valid. The BBC - in particular the Today programme - seems to enjoy making news, and setting the political agenda, more than just reporting 'the facts'. When they do this, it is inevitable that the journalists' and editors' prejudice affect the way they present news. I would like to see a return to a clear distinction between news and commentary, with some transparency thrown on the process of deciding what to give most prominence to. Right now the BBC is at its best ever! Its journalism is relevant, courageous and balanced, and is proving to be accurate despite claims to the contrary. Please reinstate Greg Dyke to confirm that you truly are made of the right stuff, befitting your world-leading role as independent news provider. Some on this forum claim the BBC will only be truly independent if privatised. Rubbish. If privatised, it will, just like ITV, have to pander to advertisers who will be able to influence the output of the BBC. Mr Dyke's job as director general was to insure that the BBC's reportage was objective and accurate. When he failed to do that and allowed the agendas of various reporters and editors to replace the need for objectivity and accuracy, he did something very wrong. He betrayed the trust of those who use the BBC for their primary source of news and information. 'Business as usual' must be the slogan. The BBC did nothing wrong in reporting the concerns of David Kelly, despite what Hutton's one-sided report said. It's a sad reflection of our times that an entire war can waged based on a lie, and journalism has to pay such a heavy price for a small gaffe. The reaction of British government is especially disturbing and confirms their heavy reliance on the media to justify the Iraq war. What now for the BBC? Scrap the license fee, Privatisation, outside regulation and open to the rigours of the free market - just like your competitors in the "real world". The Hutton Report will always be remembered as a "whitewash". Realistically, how else could it be described? We all saw the evidence, with our own eyes. We need a review of these judges making such unfounded conclusions, that are not based upon the facts. There is more than one option to getting rid of state control of the BBC. It should be mutualised and owned by its subscribers, not funded by a coercive and state manipulated tax. If the BBC is so good why need to force people to pay for it? If the UK Government had been required to check the accuracy of its reporting of WMD as strictly as it is expecting BBC reporters to do then TB would not have had an excuse for war. What is dismaying is the continuing carping by BBC staff and their supporters about Lord Hutton's findings. It speaks to a culture of arrogance, superiority and denial within the organization. If the BBC had done the right thing and apologized for printing an untrue story last year none of this would have happened. Perhaps the BBC should have told us at the time that the Government were trying to put pressure on them. They seem to have suffered in silence and why on earth have these resignations happened? Where's your backbone BBC? Stand up to these bullies before we end up with a dictatorship! The BBC is badly in need of 'sexing up' - perhaps Alastair Campbell is the right man for the job! Can it be that management at the BBC is already kowtowing to No 10 who say that they have drawn a line under the affair and would therefore prefer to keep the Dyke/Hutton aftershocks out of the news? Today, even my Murdoch-controlled Times newspaper is running a story about Greg Dyke challenging the legal correctness of the Hutton report. Why today is the BBC quite silent on this news and all the other stories relating to the Hutton report? Can it be that management at the BBC is already kowtowing to No 10 who say that they have drawn a line under the affair and would therefore prefer to keep the Dyke/Hutton aftershocks out of the news? Shame on BBC management if that is the case. This matter must not be allowed to rest with the resignations from the BBC and both Greg and Gavyn have the right, or perhaps even the duty, to question the validity of the Hutton Report along with everybody else who values freedom of speech. This latest scandal has shown that the BBC cannot be independent of a government which holds the keys to its funding and can exert political pressure. It's time to have a truly independent BBC - through privatisation. I trust the BBC a great deal more than I do the government. The BBC does its job well and should not have apologised to the government. Blair and Bush need to take responsibility for their failure to find WMD, which was and still is the main issue. The BBC should be impartial in its reporting - impartial of the current government that is (whoever they may be). Mistakes may have been made but it seems to me that the government have make many serious mistakes both factual and mistakes of judgement. Whitewash - well let's just assume that the paint brush and decorator were all government supplied. Greg should have got his lawyers to go through Gilligan's notes with all the nitpicking detail they are using on the Hutton report. No doubt they tell him he has a good chance, but it is just another hiding to nowhere. One thing that comes out of this; proof that shouting loudly does not make you right. I am resistant to any calls to abolish the licence fee. Such a move would add pressuring influences from the people who then go on to fund the organisation and severely jeopardise it's impartiality, as well as the quality of it's programmes. is £116 a year REALLY too much to spend? Most people spend much more than that down the pub every month! I'd like to see the BBC getting back to reporting the facts, however uncomfortable those facts may be. The BBC has traditionally done an admirable job in the past at defending free speech and free expression. Recently, it seems to me that political correctness has taken over at the Beeb. This is not a healthy turn of events for the British people. Healthy debate on all matters is the sine qua non of a healthy democracy. In short, I feel that the BBC has become too prescriptive and too paternalistic. Greg Dyke must continue to challenge the Government. Good luck to him. Specificities of this case aside, it is my humble opinion --as a Palestinian who long suffered and still suffer from biased American journalism -- that in the final analysis, the interest of a society is served far better with the existence of an aggressive journalistic body such as the BBC even if they make mistakes on a regular basis then to have a journalistic body that plays it safe and easily scares. A call of confidence in the BBC. Whoever is in government seems to feel that because the BBC is publicly funded it is 'their' property, it isn't, it is our, the British peoples property. Had the BBC been externally regulated the whole Hutton fiasco would not have happened. The BBC should be independently regulated but, in my opinion, by a free-standing 'public service' regulator body which is not part of OFCOM. To have all broadcast media regulated by a single all-too-powerful regulator is dangerous - we know who Alastair Campbell would be ringing up every day then. Competition in regulation, as we have in news gathering, would be healthy. It is time that the BBC stops taxing the UK and leaves that to the government. A call of no confidence in the BBC. Funny, as an anti-war protestor I always felt that the Beeb was against us! Mind you, if the BBC does present a 'balanced' view of public opinion then it's hardly surprising it might have been biased against the war. The public hardly supported it did they?! It is time for the BBC to stand tall, stand firm, and stand behind its research and reporting. It is far and away the finest organization for independent and truthful journalism in the world. If the BBC rolls over and acquiesces to the efforts of Downing Street to control its journalistic work, it will continue an unfortunate pattern of the Americanization of British journalism, where news organizations spin everything towards the ideology of their owners. Please, Britain, don't let that happen in the UK. Stand behind your wonderful BBC, and keep them independent of outside influences! Let the dust settle and go forward. Do not dwell in the past; do not keep it alive by repeated references to the past. You made the same mistake as all newspapers. You tried to make news instead of reporting the news. Basically, Hutton told the BBC editors and journalists to do their jobs better. If they have such a big problem with this then clearly there is something seriously wrong with the BBC. Gilligan attributed comments from a source that were never stated, which if believed would have had serious consequences for this country's government. If the BBC cannot recognise this, then its level of journalism is extremely poor. Very rarely do you find the people of an organisation the size of the BBC to have such embedded respect and support for a Director. It is practically unheard of, in fact. I don't work for the BBC and don't know Greg Dyke, but from what I have seen, I'm positive that the BBC will be a lesser organisation without him. It is unfortunately the case that Greg Dyke did not handle matters correctly when the going got tough; consequently the governors accepted his resignation. Sad to say he is showing even worse judgement outside of the BBC. He is hindering instead of helping and his conduct implies that the governors are incapable of standing up for the BBC while putting the management of some of its activities on a more satisfactory footing. The BBC is more than capable of getting over this major blip while keeping its independence completely intact. The BBC deserved the criticisms it got from Hutton. However, it was as far as I can see a one sided finding that paid scant attention to the actions of government. What the government did, in my view, was a disgrace. I just hope that the BBC doesn't end afraid to question the actions of government. It is the BBC's job to ask difficult questions and with any luck get it right most of the time. For the BBC to say that the Hutton Report was a 'white-wash' is totally bogus. It is clear that the BBC's reporting of the Iraq conflict was biased. We could all see it. We can all see that the BBC has also peddled in anti-Americanism. We pay for the BBC to be impartial. It wasn't. Although we all love the Beeb, we can do without paying for an institution that no only allowed serious mistakes in news reporting but now tries to shirk responsibility for them. It is totally unacceptable for the BBC to continue to criticise Hutton. I would still trust the BBC's reporting over any government's announcements. I don't feel that you need to do anything further. Losing AG was unfortunate, but necessary, a good journalist, but was wrong to force the issue so has to pay the price. GD should not have had to go. Governments come and governments go, the BBC has stood for a lot more than they do. The BBC is dead? I don't think so, long live the BBC!! It is easy to criticise, but by no means an easy task to research, adjudicate, prepare and present such a report. The days of wine and roses are indeed over at the BBC for Messrs Dyke and Davies, they should have sacked the incompetent, erroneous Gilligan who committed them both to there final found destiny, when they had the opportunity. Perhaps the grapes then may have tasted less sour. ! It is the duty of our media to now despatch this government. In my opinion the last weeks events shows that thee BBC have second-class reporters that cannot be trusted in giving us the news as it is. Its time to scrap the licence fee and let the BBC float free to raise its own funds through adverts. I'm aghast at the Hutton whitewash and feel that the whole Government vs. BBC situation is an example of just how controlling the Labour Party (once the party I believed in) has become. I simply don't believe the Government is blameless and I can't see that the BBC has done anything so very terrible. There is a feeling that the BBC's independence is under threat and with that comes the sense of the earth starting to crack under our very feet. The sight of the BBC's new management grovelling to the Government is most alarming. Thank goodness Greg Dyke is sticking to what he believes in. No, The Hutton report was completely meritorious. What is this? Journalism by consensus? As a publicly funded news organization, the BBC has a duty to uphold the public trust. The BBC violated that trust, and its Charter. Naturally, its key executives have been disgraced. Please, admit your wrongs and biases, and move to correct them. In a country with failing democracy and far too many powers in the hand the government, the BBC should be a platform of open discussion!! The BBC is one of the few big public platforms left from where a balanced and visible counterweight against an almighty and undemocratic government can be established. The BBC is rightly funded by public money (TV licence) and has a duty to inform and educate the British people in the broadest and most democratic sense. This is an amazing spectacle. The BBC reported, substantially correctly, on the fraudulent basis of Blair's actions. Nobody anywhere in the world believes the WMD claims any longer. So who should be resigning - Blair or Dyke? Britain is truly very strange. People are writing that the BBC got facts wrong, but they didn't. The BBC didn't claim anything that isn't true. Greg Dyke should never have resigned and the BBC's about the only thing in this massively deteriorating country that's stopping me emigrating. Stop the gossip-led innuendo/panto delivery; people want to know what has happened, not what staff members like Mr Marr think. Bring back some intelligence - Mr Dyke has certainly helped standards slip. Come on, get a grip! Why sack the chef and trash the kitchen when the toaster burns the toast. Any sensible organisation would replace the toaster. I personally feel that the resignation was uncalled for, people make mistakes. Greg Dyke wasn't the only person involved. Mr Dyke and Mr Davies have every right to be critical of the Hutton Report. It is impossible to have a Government that is whiter than snow. Tony will no doubt try to stifle the BBC with more regulations but which we as license payers should try to stop at all cost. The BBC get their facts wrong and heads have to roll. The Government get their facts wrong over WMDs and its business as usual. I'm more worried about the Government getting it wrong and taking us into wars than the BBC getting the odd story wrong. Hutton's conclusions are the result of viewing the BBC staff, and the majority of the population, as peasants who dared to challenge the establishment. I realise that in today's time a large part of the media try to "create" news and the BBC is guilty of this at times. It will report on a "news item" that is to be featured in a programme later on in the evening. This is just a long commercial trailer. Apart from this and some terrible light "entertainment" programmes, the BBC is to be congratulated on it's stance against government intervention and pressure as to what it should report and how it should be reported. I thought that British Governments abhorred countries that manipulated the press. Richard Sambrook must come out from behind the fence and tell the public of the pressure that Blair has heaped on the shoulders of employees of our public service. Somewhere we need members of the public services to make the general public aware of the undemocratic ways of this insidious government and their thoroughly unacceptable abuse of people who challenge them. Messrs Dyke and Davies continue to show the same arrogance and disregard for factual reporting as opposed to offering personal opinions of the "truth" which has obviously permeated the BBC. This was the cause of the original misleading broadcast and now is obviously deep-rooted in the news media and correspondent side of BBC. Hutton has reported on the enquiry findings - now shut up BBC - and concentrate on putting news REPORTING first and restore some integrity. Whatever way we favour Hutton's report it is important not to let this cloud the issue of the so called weapons of mass destruction which we went to war over and people (on both sides) died over. I hope the BBC does not let this single setback cloud its reporting of the more important issue in the future. We need to know the real reason we went to war with Iraq. Who do the BBC think they are? They want the right to investigate and criticise. But don't want to be investigated and won't accept criticism for what they have done (badly). Totally staggered by the Hutton Report. "Whitewash" is too mild a term. Greg Dyke's resignation should not have been accepted. The BBC must not buckle in the face of smug, self-righteous pressure from the Government, but stand firm. The BBC is one of the VERY BEST things about our country and is a shining example of the superiority of the public over the private (unfortunately now one of the few). Everyone loves the BBC, but it made a big mistake. Their has to be people taking responsibility. Greg Dyke, although popular man (maybe that is his problem), has shown he is not the man to lead the BBC. If the editorial staff had been a bit more mature and responsible, this never would have happened. You reap what you sow. Now Greg Dyke has gone, Tony Blair shouldn't appoint the new Director General. How about giving some power to the licence fee payers, and separating government and media by letting us choose and having some say for out £116? We can't say there isn't the technology when as many people vote in Big Brother, Pop Idol and I'm a Celebrity as they do in the local elections! The Government would probably be too afraid that popular and democratic power would reinstate Greg Dyke. The senior management of the BBC have shown great integrity in resigning even if the bias of Hutton's report should be examined. It is a great shame that the PM's senior staff don't have the same integrity. Mr Hoon has been proved a liar, points totally ignored by Hutton. If he had any morals he would resign! Greg Dyke resigns because a mistake was made in inaccurate reporting by subordinate staff. Tony Blair made a mistake in accepting an inaccurate report from subordinate staff too. Shouldn't he resign too? The BBC is still one of very few great British traditions that I, as a Brit, am very proud of. The BBC governors were wrong to accept Greg Dyke's resignation. Mr Dyke was clearly embarking on an ambitious and successful series of fundamental changes to BBC culture, all of them ultimately designed to result in better programmes and services for audiences. Mr Dyke is a rarity in public life - charismatic, visionary, popular and possessing a deep integrity. Ironically (or fittingly?) it was his integrity that has now left the BBC and the country bereft of his exceptional skills. Sorry, am I missing something. What had Lord Hutton got to gain by not telling it how it was? Can someone please explain to me the difference between number 10 'strengthening the September dossier'(as Hutton puts it), and 'sexing up' the dossier (as Gilligan claimed). To me it is still a distortion of the truth, which the government needs to answer for. Gilligan should go. There should also be some internal review and action in regard to your "TODAY" program, I used to enjoy it until the aggressive "In your face" interview style began to sicken me. Quite a number of the presenters and reporters seem these days a touch arrogant. Let us get back to unbiased, factual reporting and commentary. I hope the BBC learns from this that it can either be a political party or a news organisation but it cannot be both. Davies and Dyke have betrayed the public trust. The BBC is financed by public money and the public want and deserve the facts and they will decide. The BBC was at one time a trustworthy organization - no more. The BBC should not be taking this rubbish lying down. Teflon Tony has weaselled his way out yet again. Get Greg back - he's the best thing that's happened to the BBC for years! Stop wasting licence money on blockbuster movies, American series' and sport broadcasting - leave that to the commercial channels and DVD rental shops. Concentrate all resources instead on internal productions and documentaries, and their quality should improve. BBC may have lost a battle but it has not lost the War. The BBC may not be perfect and may have been mistaken, for which they have apologised, but I do not believe they have been dishonest, nor that they have acted maliciously. We need the BBC to continue to feel and be free to question any Government - in a manner unbiased by party politics. I am very happy for my Licence Fee to help fund independent truth-seeking. The BBC has accepted Lord Hutton's criticism, but now I hope they move on and feel able to hold its head up high once more. Am I the only person to see the way the media have tried to run Government and not just report the things it does or tries to do? Am I the only person to see the way the media have tried to run Government and not just report the things it does or tries to do? The way the news today is being turned around to make the PM look bad yet again. If Hutton had gone the opposite way you would have not stopped until the PM and Mr Hoon and no doubt various other's would have been hounded out of office to give you the headlines on your news bulletin. I welcome wholeheartedly the resignations at the BBC today; They have been a good few months overdue! For the past few years the dumbing down of the BBC in general and the increasingly partisan reporting in particular, have been eating away at the once unimpeachable reputation for independence of this formerly great institution. I sincerely hope that any changes at the top rapidly filter down to programme makers and presenters. It is about time we were done the courtesy of presentation of the news as fact and not opinion. Tony Blair has sacrificed the BBC to save his own skin. The BBC is more important than an individual - even if that individual is the Prime Minister. What a sad day for the UK and for democracy. These resignations whilst not unexpected are an extremely sad blow to the BBC. Tony Blair needs to consider his stance on such issues very carefully. How he deals with his "victory" could have a major impact on how he (and his party) is perceived by the voting public. We all love the BBC as a unique and quintessentially British institution - everyone makes mistakes, now it is time to move forward and please, no more resignations. Without the BBC who do we have to challenge the Govts stance? Michael Howard? I think not! Blair is behaving like a school child demanding an apology. The BBC is the unfortunate victim, I hope their editorial independence doesn't suffer. The idea of regulating the BBC is nearly as absurd as the idea of subsidising the BBC. You have regulators and judges claiming to act in the interest of the public, regulating journalists claiming to act in the interest of the public. All of them, meanwhile, draw a salary from the public. I don't need to be protected from bad journalism - just don't force me to pay for it. More, not less, power to you. I salute Messrs. Davies and Dyke for their moral courage. The BBC has to improve some internal processes but must resist greater regulation (emasculation?) Let us always remember we need a free and robust public debate to help keep leadership decisions open, transparent and accountable - perhaps more than before as PR and 'spin' is so common now. Not one thing is perfect in this life but no other organisation in the world has come near the BBC in delivering this function in my 60 years More, not less, power to you. As the International viewer through BBC World, I find the BBC is the most reliable news broadcaster in the world. However, I stick by BBC no matter what people say and keep on going what you do. You have done such a very good job. I understand the remit of Hutton was to investigate the circumstances surrounding the death of Dr David Kelly. Kelly gave an 'off the record' briefing to journalists. (Does the Government not do this all the time?) It then, it accordance with normal journalistic practise, attempted to protect the source. The government then ensured that his name was made public, leading directly to the chain of events that led to his death. I am at a loss to understand how the MOD and the government can therefore be found blameless. Are we now to see government sources coming forward, and their names put in the public domain? I doubt it. The Hutton report is one-sided and carefully skirts all important issues - specifically why the UK went to war on 'weak' evidence or included the 45min claim on the basis of one source. This is made even more pertinent in the light of David Kay's comment "intelligence that Iraq possessed stockpiles of chemical and biological weapons was false." Greg Dyke did need to resign, but what about those really to blame? I think the BBC is missing the stories I want to hear about... I want to know who leaked the report to the Sun. I want to know what will happen to Andrew Gilligan and the editor of radio 4's Today programme? I think the Hutton report IS a whitewash, however, I agree that there were management errors on the Today programme (a reflection of the rest of the BBC) and, as is usual in these situations the top man falls on his sword, so yes Greg Dyke did need to resign, but what about those really to blame? Now that the Director-General and the Chairman of the BBC have resigned in an honourable and decent manner, when can we expect a Government minister to act in a similar manner, e.g. Margaret Hodge, Geoff Hoon? Or is that too much to ask of members of the present Government? There is no doubt that both the BBC and Tony Blair will survive since they are the best available. However Andrew Gilligan should certainly go and I am afraid that all this mess was originated by Dr. Kelly's unfortunate breach of trust by discussing what may be considered also a breach of security. The BBC are not blameless in permitting this to take place. Alan Perry, Kitchener, Ontario Canada. Stiffen your backbone BBC and carry on! In a country were we have always boasted democracy and freedom of speech, one can't help feeling were coming under Teflon Tony's Kosh. Stiffen your backbone BBC and carry on! Hopefully Labour government heads will roll at the next election, and some kind of democracy can be restored. Isn't this a golden opportunity to finally rid the BBC of the cancer of sensational news creation, rather than factual news reporting? We've suffered the former for too many years. I have just heard the news that Mr Greg Dyke has resigned. I am outraged that this squalid and discredited Government has forced both Mr Davies and Mr Dyke to fall on their swords in order that they may protect the corporation. I sincerely hope that the British people vote the Labour Government and it's spin master goons out and into the gutter where they belong. As for Messrs Dyke and Davies I can only wish them the very best for the future and commend them for their sense of honour and integrity. The problem is the lack of a credible opposition in British politics at the moment. Institutions like the BBC (rightly or wrongly) are often too enthusiastic in trying to fill this void. The government has also become too arrogant and often does not see the need to clarify issues that would avoid many outside government feeling there is something suspicious going on. Most important is that the BBC does not weaken in these difficult times. Until the Tory Party recovers it provides the only effective opposition. Many Americans turn to BBC for world news since the giant media conglomerates in the USA have made their unpublished motto "All the news that is fit to tint." The welcomed resignations at BBC will insure that BBC does not follow that path. The BBC hold themselves to extremely high ethical and editorial standards. Last June, I had the good fortune to attend a panel discussion on ethics at the BBC World Service at Bush House in London and was only further convinced of this. If the Hutton report shows anything, it is simply that even the very best sometimes make mistakes. The BBC's actions in the aftermath of this report -- accepting responsibility, apologising --underscore the professionalism of the organisation. Perhaps a ''judicial review of the judiciary''; certainly one sided justice is no justice! I have something to admit, I voted for Tony Blair, and today I'm very sorry. I won't do it again. Such a fuss over this story. The tabloids make false or exaggerated statements all the time. They might get a rap on the knuckles, but the management aren't forced to resign each time. Personally, I will still believe the BBC over Teflon Tony, and I hope that this affair does not lead to greater political control of the corporation. That would be a tragedy. Let's face the facts: The BBC filed an unsubstantiated and unfounded story and passed it off as reality, then failed to apologize. Eventually, everyone has to face the truth, and the BBC has long refused to do that. It was only a matter of time. What about Andrew Gilligan? If he wants to retain any level of integrity he has to go, soon.